It be great to have the unlimited monies for a full-scale laundry room re-do. Most of us are on budgets. 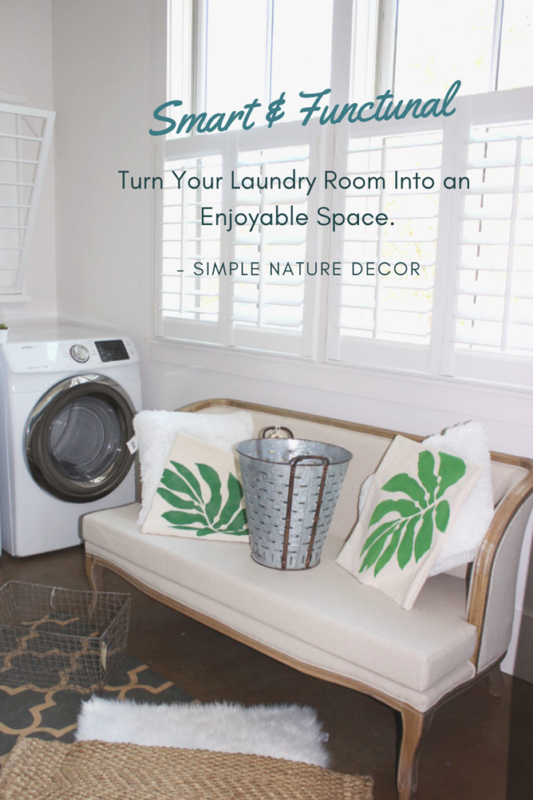 I found easy, inexpensive ways to make my laundry room space look different without spending a fortune. 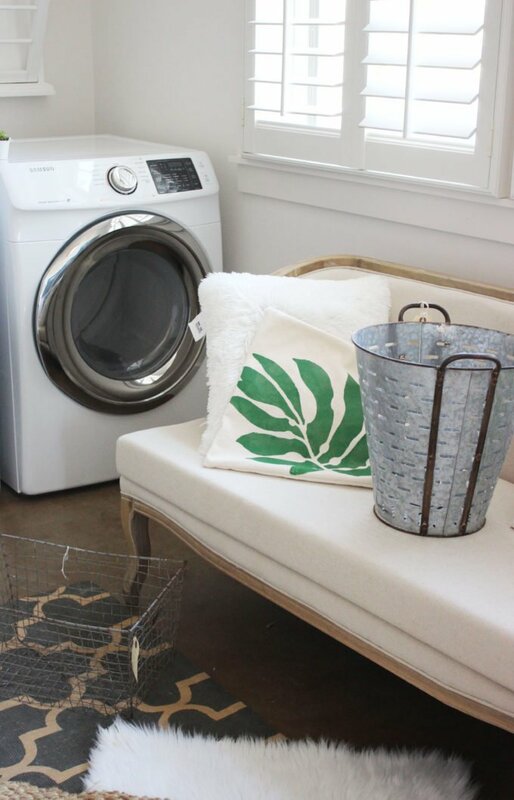 It’s been a dream of mine to turn my laundry room into an enjoyable and functional place. I wanted it smart yet relaxing. I wanted to make the tasks of washing, ironing and folding less of a chore and more of a pleasure. The room is designed with everything you need. When I designed the space I made most of every inch. Above the washer and dryer I had installed a drying rack. I also added reclaimed wood shelves to hold soaps, towels and some decorative accents to give charm. There is a large cabinet for more storage. In the side of the cabinet space is a bench for more added storage. There are lots of large windows for lots of light. It’s such a cheery space. 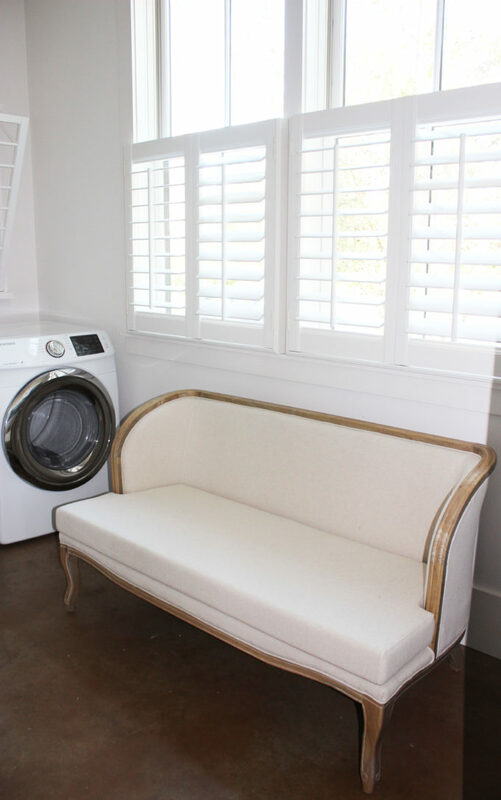 I added little sofa that is the main focus of this room, here is where I can relax and read a book while the clothes are drying. Open shelving keeps everything accessible. 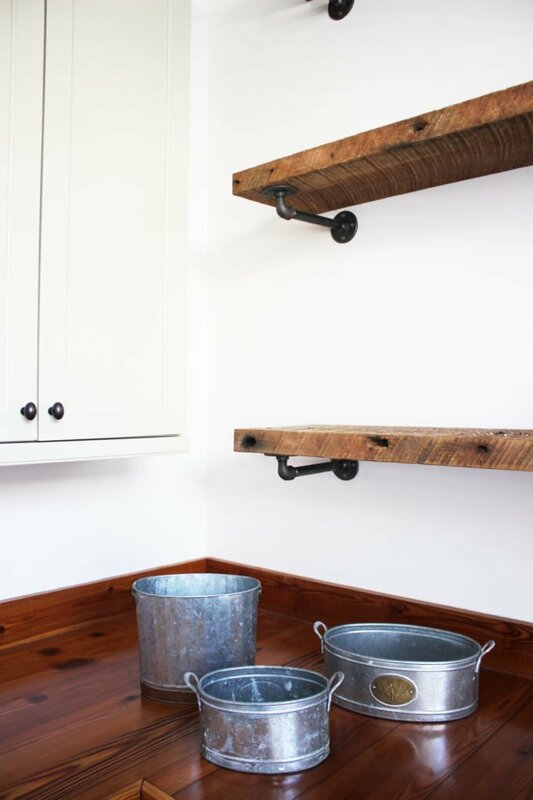 The open shelving was made with plumbing pipes that were installed with screws into the wall. The Reclaimed shelves lay over the pipes. 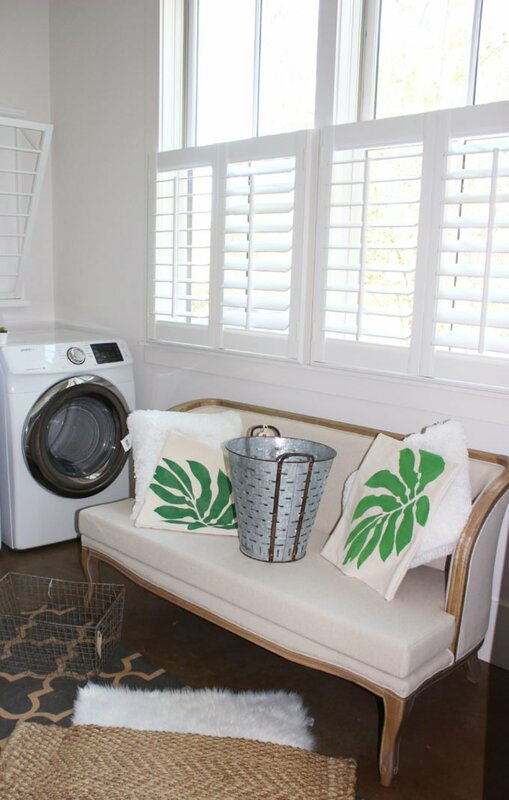 The planters, wire basket, metal basket and colorful rugs are all part the theme for my laundry room space. I have been working hard stenciling pillows. 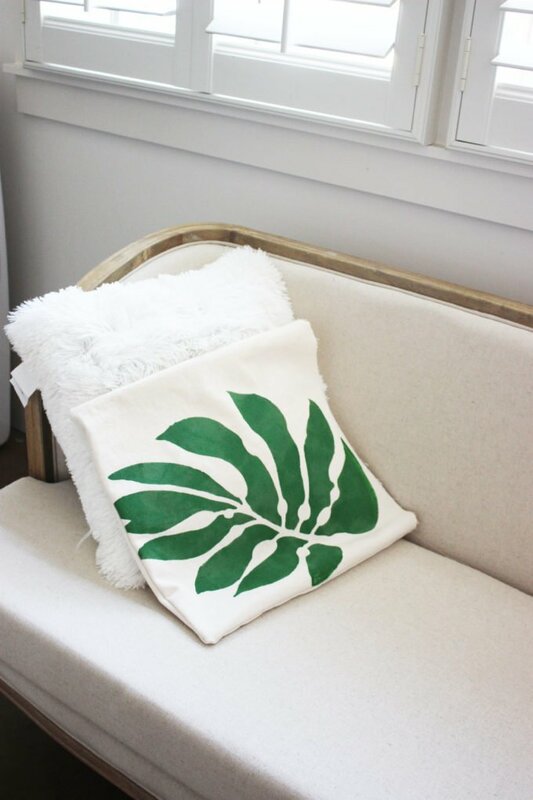 Check out the stencil pillow here. These pillow will be perfect for the settee. Botanical framed prints will be places on the shelves to give the whole laundry space a pretty charming. My goal at the end is to stay on budget which I did. The open shelving saved me lots of money instead of installing upper cabinets. I love all the details and the fun touches in here. Those wood shelves are looking really good, and with the couch and pillows I can really picture the space. Can’t wait to see it unfold! I hope you get everything you need to, done, in time for your vaca! Thanks Ariel, I literally panicking waiting for these botanical prints, I’m thinking of printing them out from a different website. Hopefully they will come back in a few days. I love that stenciled fabric! Its very difficult to do the stencil on this fabric, but thats all I had.Hopefully it will look good on the Sofa. Loving all those details, especially all the succulents! All the heart eyes! Wow Maria..this space is going to look so amazing and serene! I love all the sneak peeks! Hope you enjoy your short vacation and not fret too much about all that still needs to be done. Going to all come together! Thanks so much for such a sweet comment! I am looking forward to getting away. 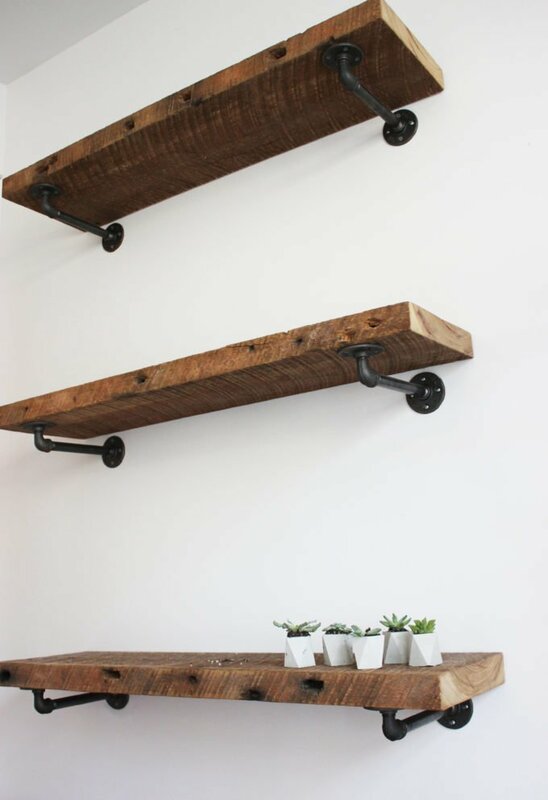 Crushing hard on those shelves!! Thanks so much! I hope it comes together on time. I love EVERYTHING about this! Gorgeous and so glamorous! Thanks so much Crystal! I do like the furry rugs, it does give a glamour vibe. It’s looking good! I love the shelves! Thanks Amanda, the shelves will be my biggest challenge. I love everything in here! The pillows are perfect for the space, and those shelves are so pretty! Thanks Meg, Its getting close and I am nervous for the few items I have not received, have a nice weekend. It looks amazing so far! I love the texture of everything. Thanks so much! I love all the different feels. That sofa is incredible!!! And SO many pretty accessories! LOVING things so far! So happy to hear that your electrician came through for you! I know it’s so hard waiting for things to arrive when you’re on a deadline. Hopefully those prints show up this week. Thanks Erin, What a weird situation with this electrician, I’ll have to tell you someday! to long to post! Maria…was that a sneak peak of your lighting? that last image? Oh, I can’t wait to see it…looks fantastic. And I am all in for the solid sisal…think it just really brings it all together. And somehow I missed the story on that little settee…but it is just lovely. Can’t wait to see the big reveal and enjoy the beach! Yes I added that in post 2, lol, always changing things around. I hope you had some time to enjoy yourself and not stress for awhile. It’s so frustrating to wait on something when you needed it yesterday. I love the prints you chose and I would still love to see them on your wall. Everything is looking awesome! I love the sisal rug and I’m looking forward to seeing the reveal! Hello Carol, Love that name of your blog! Looking forward to some leisure time at the Caribbean, heading there now and will be super relaxed no worries. Everything you’ve done this week is spot on! Can’t wait for next week! I’m loving everything about this space! I’m excited to see it finished.